Built model sold in displayed case. Model was to show the scene as described the on the box or was in the instruction?. I had painted the floor to show old concrete and new around the floor vault. I had wanted to add oil spilled that were wiped away and paper tubes roles amongst other things scattered on the floor, but never got to doing it. This is a 1/6 scale Horizon She-Hulk vinyl model kit. Like all vinyl model kits it requires trimming with a hobby knife, and assembly with super glue. The detail is great! 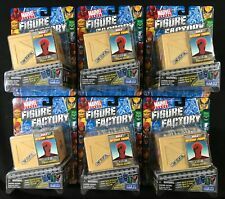 These kits are brand new and have all of the original product literature. Marvel Crochet Kit Avengers. This was opened but not used. HULK Marvel Avengers Metal Earth Legends 3D Laser Cut Metal Model Kit MEM003 NEW Condition is New. Shipped with USPS First Class Package. 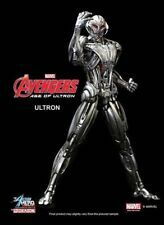 This is a Dragon 38148 1:9 Ultron Multi-Pose Action Figure. Special Features: - Menacing, intimidating pose featuring the movie's main villain! - Metallic painting with weathering for realistic effect. - Intricate detail on head and face - Realistic diorama display Manufacturer: Dragon. Model Number: 38148. MSRP: 195.95. Category 1: Other Toys. Category 2: Model Kits. Availability: Ships in 1 Business Day!. 5 gem stones and hero coins. Multiple art pages can easily be combined because they are light and thin. For instance, two statues require a much bigger box. This is normal in our experience. A RUN will be a collection of consecutive issues with no breaks in between them. Instruction sheets. 39 pattern sheets. Learn how to make-. The use of model kit techniques allow us to reproduce the intricate details and sharp lines to maximize the usage of the official 3D character scans. 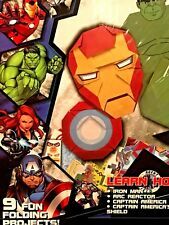 MARVEL AVENGERS ORIGAMI & Fun Fold-ups 9 FUN Projects Includes Stickers NEW. Condition is New. Never assembled, we opened the box and inside bag to display pieces. Lot of 2 new Walgreens exclusive helmets. Very cool displays! Thanks for looking. The Daredevil with exploding grappling hook. New in the box from 1994. Incredible Hulk. Incredible Hulk's Fist. 36 Character Sheets. Instruction Sheets. I would be more than glad to do that for you. 39 Pattern Sheets. 9 FUN FOLDING PROJECTS-INCLUDES STICKERS-AGES 7 . LEARN HOW TO MAKE. Hulk's Fist. Incredible Hulk. Photographs – Photographs are taken in bright lighting and as clear as possible to try to show the item’s condition. Marvel The Avengers Infinity Gauntlet. Brand New. 15 INCHES LONG!!! THANOS!! Brand new item. THIS IS A COSTUME ITEM. MADE OF HARD LATEX MATERIAL. Item slips on. Easy to get on and off. Each piece is hand cast and hand finished to exacting standards. Sideshow Collectibles. No wear to the statue. The base has light scuffing. Rare exclusive edition statue with only 500 made. This one is #288/500. Lowe's Avengers Build & Grow Black Widow. Wood building kit. Glow in dark stickers. Fun kit for the collector, long out of production. Lowe's Avengers Build & Grow HULK. Wood building kit. Communication is the key in avoiding any issues. No glue needed. Not for beginners. AVENGERS AGE OF ULTRON. HULK 1/10 SCALE PRE-PAINTED MODEL KIT. WE HAVE AN EXTENSIVE INVENTORY AND A KNOWLEDGEABLE STAFF. BIG BEN'S COMIX OASIS BUYS COMICS ! 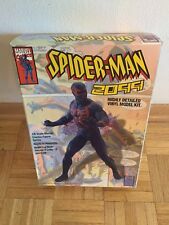 Toy Biz Ghost Rider Model Kit 48660, 8 3/4" Tall. Condition is New. Shipped with USPS Priority Mail. Blind Box Digging Kit. Marvel Infinity Gem. 1 of 11 Gems. I had looked up the codes online, and every source I've found only lists codes for Series One using letters from A-M. The codes on these are L (White Storm), M (Black Mohawk Storm), O (Unknown), P (Unknown), R (Unknown) and T (Unknown). Each model is perfect down to the most minuscule details. Each model is made from entirely flat, laser-etched steel sheets. War Machine. We apologize for the inconvenience. Tools are not necessary for assembly, but can greatly help with the process.